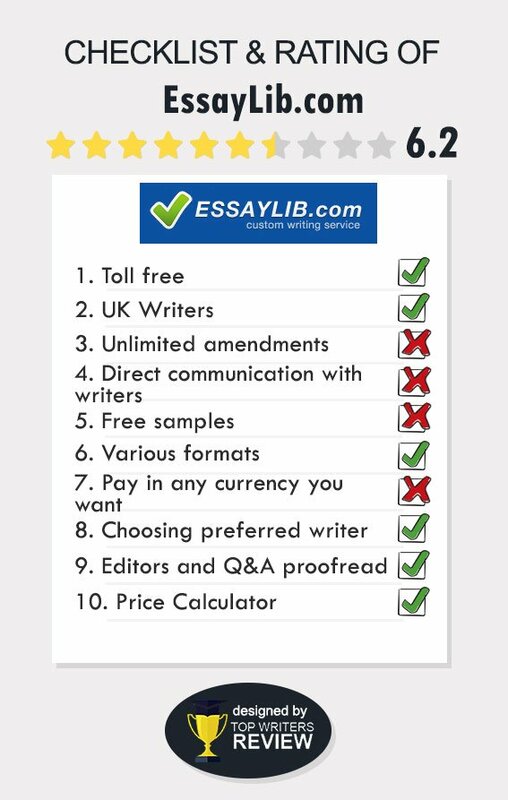 Essaylib.com has been providing online writing services to students since 2008. In that almost 8-year period, it has provided a lot of products, and there is thus a body of information that we are able to use to evaluate the quality, service, and other features of the company. In keeping with the standardization with which we review all writing services, we are providing this EssayLib review based upon the following factors: the company-provided information on its site, the published policies, prices and discounts, benefits, site-based Essay Lib testimonials, feedback that has been provided from other sources on the Internet, and the results of our own queries and the ordering of a research paper from the company. The categories that follow are the same categories we use for all of our reviews. Essay Lib produces academic products for students at all levels of academic study. These products include all of the typical writing assignments given in any institution – essays, papers, case studies, book reviews, projects and proposals, presentations, lab reports, coursework assignments, and, at the graduate levels, theses and dissertations. In addition, students may order admissions and personal statement essays for college and graduate school. We did not find editing or proofreading as a provided service. The company does have a customer support function. While it states that this function operates 24/7, it appears that it is closed on Sundays. We were able to place calls at various times and receive a representative to speak with. Questions about dissertations were a bit difficult for the representatives to answer, and we were told to place our order, pay for it, and then discuss our questions with the assigned writer. Most customers would probably not be willing to do so. The customer testimonials found on the site. These were all quite positive, and customers were pleased that their instructions had been followed, that the products were delivered on time, and that the quality was quite good. EssayLib customer reviews that we found other places. Here, the reviews were more mixed. All customers stated that the ordering process was straightforward, that their instructions were followed, and no one mentioned receiving a product late. There were some concerns over quality, however, and these included word usage, organization structure, and, in some instances, content that was far too elementary for the academic level of the customer. EssayLib BBB status: While the company is not a member of the BBB, there were no consumer complaints filed. Sample Products: The site contains a blog which we accessed. While most of the entries related to using essay writing services in general and EssayLib in particular, there were some sample essays provided for review. We reviewed an essay on alcoholism. The introduction did state the topic but no thesis statement was provided. It was therefore difficult to follow the content flow. The other issue we had was that some important factual information was not included. Our Order: We received our order on time, and the specifications we provided were all met. However, we ordered a 3rd year university product, and were disappointed with the style of writing and the resources used. The paper would have certainly been appropriate for the high school level but not for the level we indicated. Even with the concerns expressed, we do find that EssayLib is not a scam. EssayLib.com prices are about average for the industry. Our paper, 8 pages with 4 resources, was priced at $144.00. Pricing is based upon academic level, type of product, and deadline urgency. 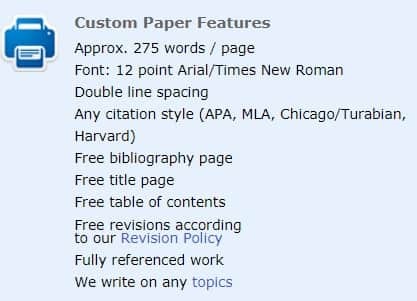 The range of pricing is from $10/page for a basic high school essay with a 14-day deadline to $50/page for a Ph.D. level work due in 48 hours. 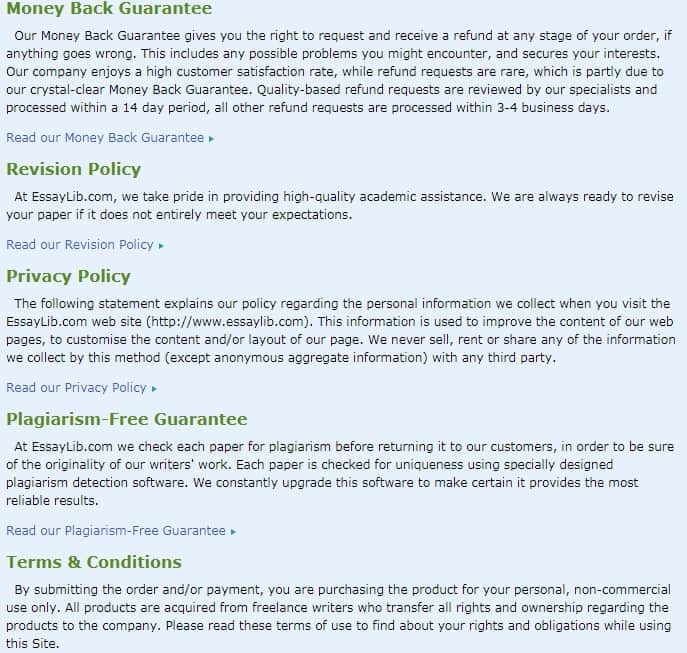 Further there was no Essay Lib promo code that would provide a discount for new customers, as is often the case with writing services. Customers may make payment via any major credit card and PayPal. We found the payment procedures to be quite secure, so no one should feel uncomfortable providing his/her card information. EssayLib discounts are based solely on the total amount of money a customer spends. When a customer has spent $500, a lifetime 5% discount is provided; a 0% discount applies when total expenditure has exceeded $1000; and a 15% discount is given to anyone spending over $2000. The company states that customers are to put in a request for these discounts when they qualify and that EssayLib.com coupon codes will then be provided. There are the normal free pages provided with any order – title, bibliography, and table of contents. The company also provides free revisions within the terms of it revision policy which is published on the site. In addition, a student may request a higher level writer for additional cost – 3 levels are offered. This company claims to have hired professional writers. This is not the case. Everyone should beware! do not use this company! I gave very detailed and specific instructions upon placing my order, I even paid extra to have it fast tracked. The type of paper was specified multiple times, which was an argumentative essay. By the end of my experience, the so called "professional writer" had written a paper that did not fit the necessities of an argumentative essay at all. The paper was worth a zero percent; however, my instructor was generous enough to give partial credit as a 50% even though the paper did not deserve it. The company refused to take responsibility, and did not refund me. In the future if this happens to anyone, know that you can seek legal action if you so choose. The company provides false information to simply get your money. They do not hire professional writers. They say this is a company guarantee and it is not. If you can prove the writer is not a professional, you can be heavily compensated for the company's lies and misconduct. Also, I have yet to receive a refund. Where are those highly skilled writers that you have promised me? Are they all busy or what? Why did some mediocre writer do my paper? Where are so many mistakes from? I'm very disappointed and angry! I don't how I could entrust my paper to this unreliable company! They've missed the deadline terribly!